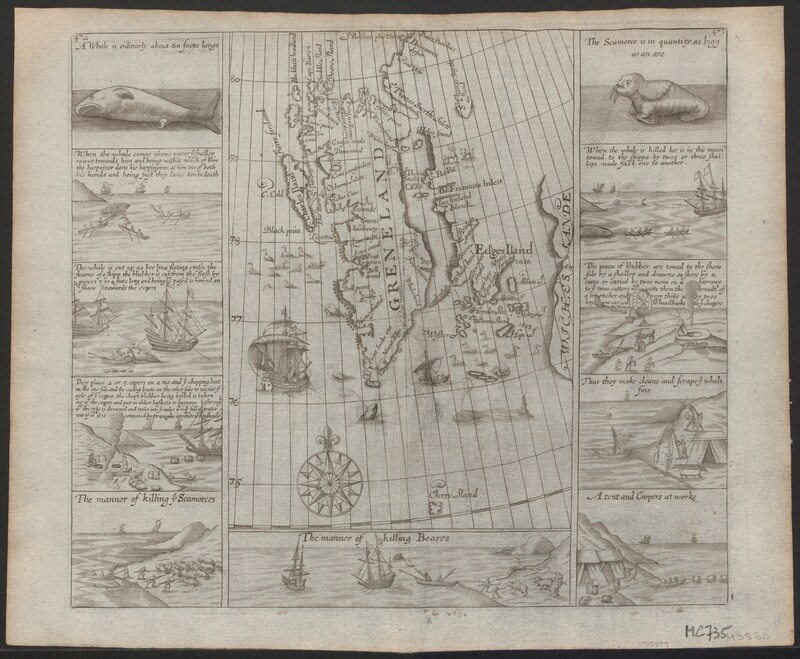 ‘Chart of Spitsbergen’ by Thomas Edge from Purchas His Pilgrimes of 1625 (Third part). Whaling, Bear Hunt and whale oil cooking are illustrated. This is the last English map before the Spitsbergen activities by the English came to a standstill in 1622, which were never to be resumed. When Dutch names were introduced on the western part of Spitsbergen, the English names on the eastern part were maintained by Gerritsz on his 1628 manuscript map. Detail. The Japanese map was produced shortly after Admiral Perry opened the Japanese ports to Western countries, effectively terminating the Dutch monopoly in 1853/56. The map is made by Sadahide and occurs in three states one of which we saw in Chicago during our visit to Barry MacLean’s collection, when returning from Milwaukee (or was it on their display in the Arts Institute where Richard Pegg was our guide?) 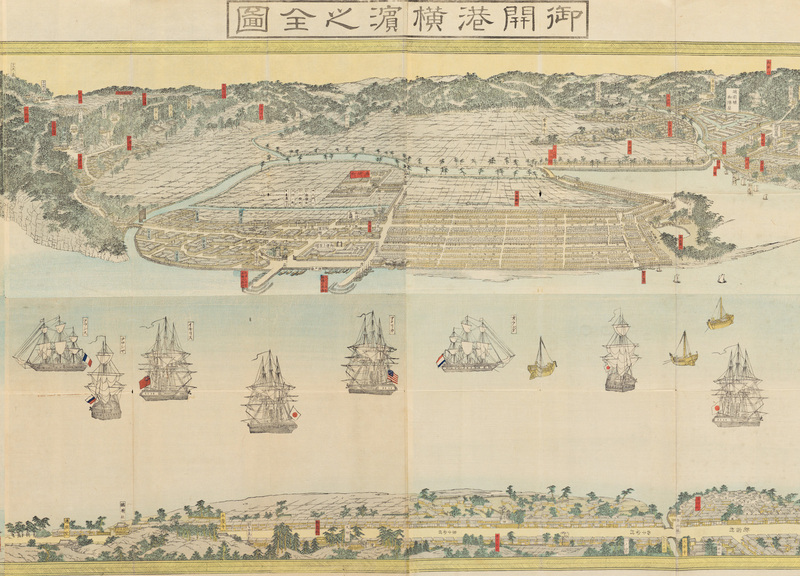 The map is dated 1859 or 1860 as the Kanagawa Bridge ( completed in 1859) is displayed where the third state was produced from the same, but corrected six woodblocks only little later. In this projection the eye is situated 7/10 of the radius distant from the surface of the sphere. From Lowry’s Table Atlas Constructed and Engraved from the most recent Authorities. Drawn and engraved by Joseph Wilson Lowry. Published by Chapman and Hall in 1852. No. 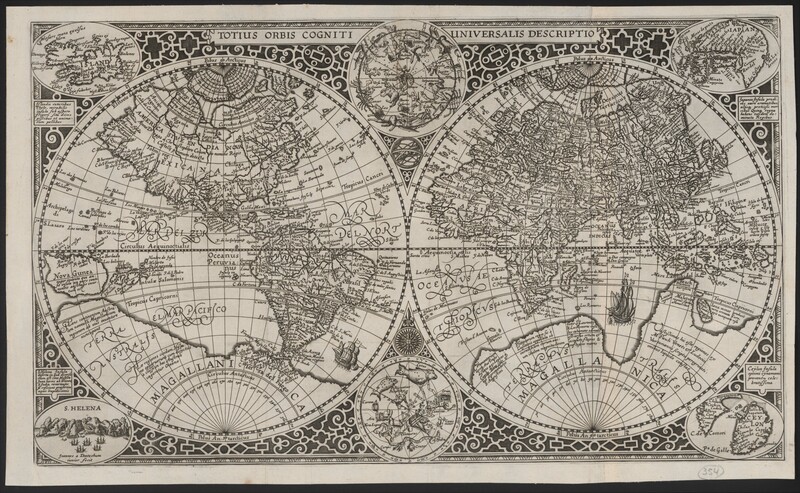 of maps: 100 engraved maps. Page size: 310 x 235mm (12.25 x 9.25 inches). 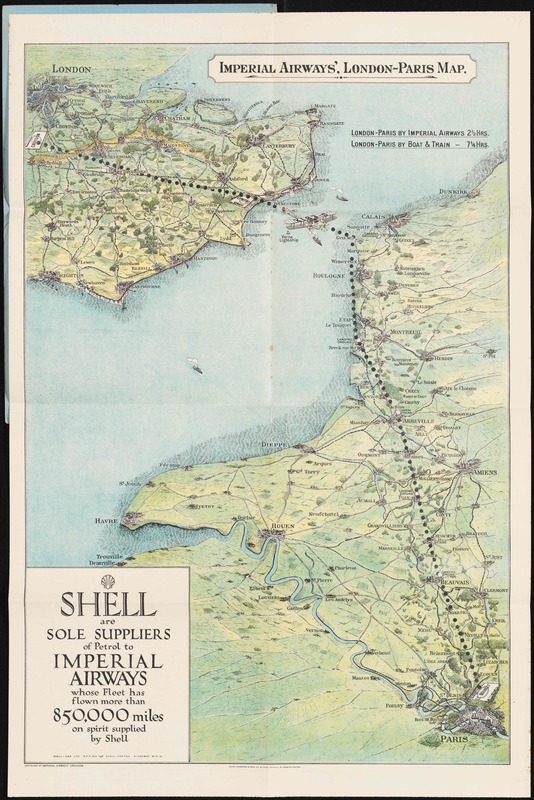 This chart was used by Imperial Airways (precursor to BOAC and British Airways in the 1920s) as an advertisement and incentive to fly with them. Noteworthy are the routings selected for minimum time above water and following a track from airport via airports to destination. This would allow intermediate landings when technical failures might occur and would facilitate visual ground referenced navigation. Of course, Croydon would be the London Airport and Le Bourget the airport for Paris, as both were located close to the city centre. This is a 1858 copy of the famous Duke’s map, held in the British Library. 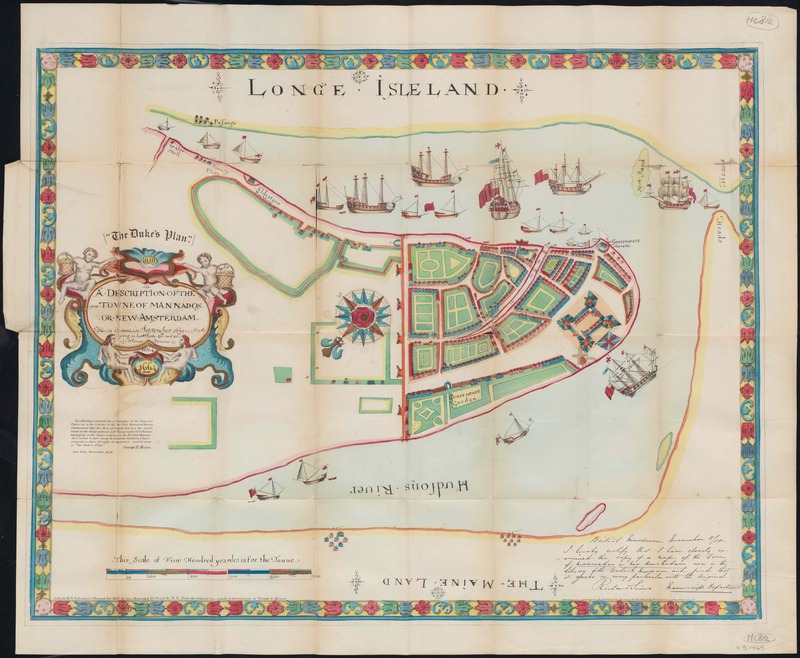 It shows the southern part of Manhattan after the transition from Dutch to English rule in 1667/76. A manuscript note on the copy by the curator of maps certifies t6hat each and every item is correctly copied. Present-day Wall Street is shown as are the main buildings from the Dutch period (Church, Governor’s mansion, gallows etc). This chart dates from 1843. The reclamation of many Dutch lakes had been executed from 1597 onwards. 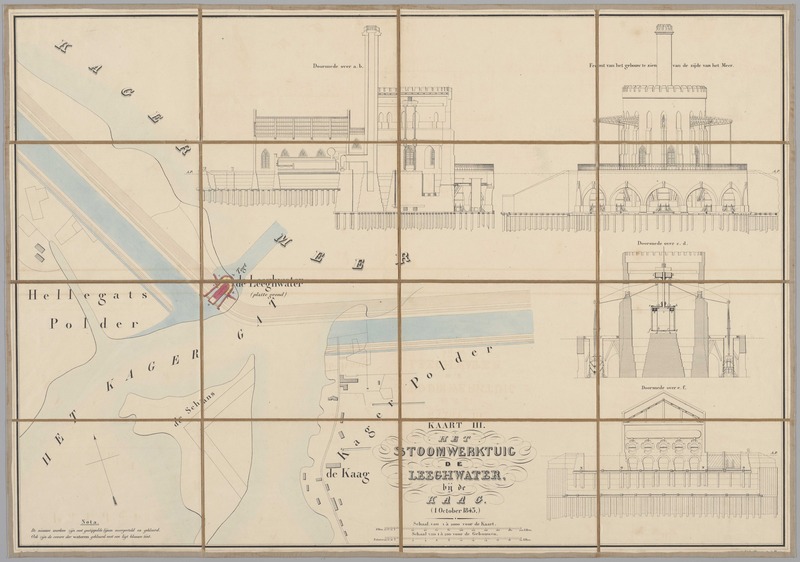 The reclamation of the Haarlem and Leiden lakes (one lake) was too much for the technology of the day. Many plans had been devised, all cleverly conceived but impractical. The ‘Waterwolf’ repeatedly ate land from the eastern shore of the lake, threatening to breach the land and unite with other lakes further east. The initial plans called for over one hundred windmills to reclaim the lake. This would mean a huge investment, basically going to waste after two or three years when only a few mills would be needed to keep the polder dry. After the invention of the steam engine the reclamation was done from 1850 to 1852. Of three identical steam-driven systems, one has been preserved and may be visited. The engine can be driven hydraulically now. The system uses the biggest steam engine in the world and the pumping system employs an innovative pendulum-type bucket system, dipping 9 big buckets sequentially into the water to be removed and discharged at a higher level for exit into the North Sea in the end. 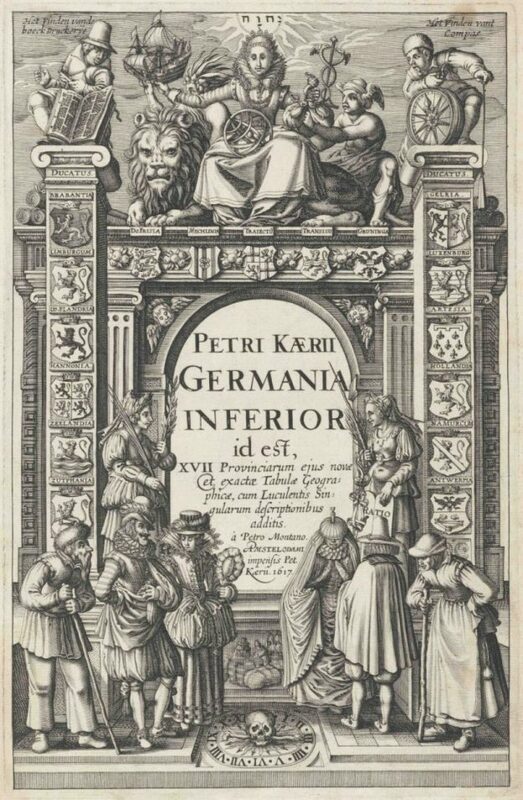 The detail of this title page belongs to the Germania Inferioris 1617 edition in Latin by Petrus Kaerius. Only one other edition was published in French in 1622.The maps are the same but on the first pages a poem by Petrus Montanus is replaced by a poem of another author.